Imagine instead of the Arc de Triomphe a overcrowded sixty-foot mountain on the place d'Etoile! The Parnasse français of Titon du Tillet belongs to the very beginning of the 18th century; and seems on the cusp between the 17th century world of masque and monument and the wilder sculptural imagination of a later era. 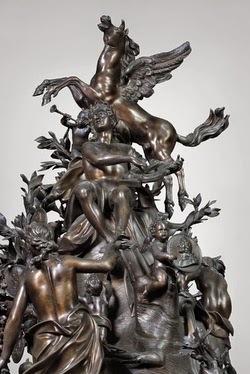 The sculpture was to represent a "French Parnassus" glorifying the golden age of Louis XIV and populated with the writers and musicians of the grand siècle. It was a grandiose and obsessive project which consumed dreams and the energies of its originator for much of his adult life. Évrard Titon du Tillet was the fourth son of Louis XIV's colossally wealthy director general of royal armaments, Maximilien Titon, builder of the "folie Titon" rue Montreuil, later to be reincarnated as the Réveillon mansion and wallpaper factory. Évrard was born on 16th January 1677 and baptised in the Jesuit Église Saint-Paul nearby in the rue Saint-Antoine. At fifteen he acquired a commission in the infantry and shortly afterwards became a captain in the dragoons; this military career - for which he was probably ill suited - was abruptly cut short when his company was disbanded after the Peace of Riswick. Titon du Tillet then set upon making his mark at Court. In 1696 at the age of twenty, he acquired for the considerable sum of 31,400 livres the office of maître d'hôtel to Marie-Adelaide of Savoy, duchess of Burgundy and future Queen of France. There was every expectation that this was the road to preferment, but Évrard's hopes were again dashed, this time by the smallpox which in 1712 carried away both the Duke and Duchess of Burgundy leaving only their infant son, the future Louis XV, to inherit the throne. At this point Titon du Tillet seems to have given up any idea of public life. He left Versailles, bought the sinecure of commissaire provincial des guerres (for the sum of 100,000 livres) and gave himself over to the leisured cultivation of the arts. He settled permanently at Titonville, where he had inherited part of the property and in due course bought out the share owned by his grand-nephew. Titon du Tillot was, by all accounts, a gentle, well-liked and highly cultivated man, who spoke several languages fluently and played the bass viol "passably". He travelled extensively in France, Italy and Switzerland. He commissioned paintings, sculptures and prints and amassed a large library, acquired in due course by the unfortunate Réveillon. He also set up a small private theatre in the grounds of Titonville. Ever dogged by bad luck, he lost a substantial part of his fortune to John Law and "le fatal systeme du Papier de 1719". He remained unmarried and died in the rue de Montreuil on 26th December 1762 at the grand age of eighty-six. He was buried close by in the chapel of the Religieuses Hospitalières de Saint-Mandé. 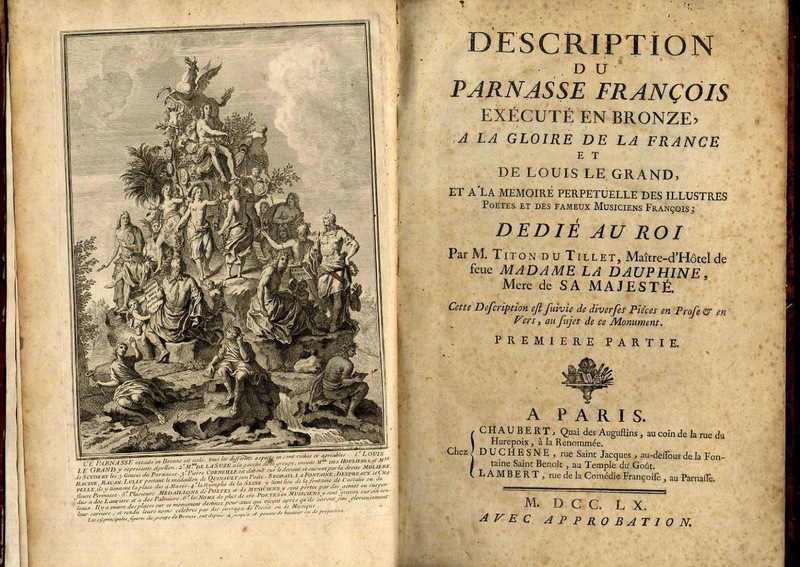 Titon du Tillot seems to have first conceived the idea of the Parnassus as long ago as the 1700s; it began life as a courtier's project to glorify the Sun King in the conventional fashion of the age. A penchant for monumental sculpture ran in the family. In 1701 his father presented Louis XIV with an equestrian statue in the newly-invented cast steel (acier fondu) which was favoured with a place in the petits appartements at Versailles. His elder brother,Louis-Maximilien Titon, a royal and civil procurateur, had already helped to erect royal statues in Paris, in the Place des Victoires and the Place Vendôme, as well as outside the Hôtel de Ville. Titon began by drawing up a list of figures to include: he reports his preliminary discussions with the poets Nicolas Boileau-Despréaux and Jean-Baptiste Rousseau. 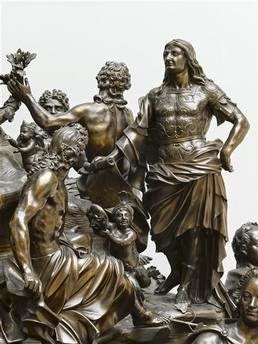 The sculptor Louis Garnier was commissioned to produce a maquette in 1712, which he duely completed in 1718, though it took a further three years for the figures to be assembled. Nicolas de Largillière advised on the portraiture. This bronze, seven-and-a-half feet high, is the only surviving three-dimensional representation of the Parnassus. A rocky mountain decorated with laurel, myrtle and palms is surmounted by a rearing Pegasus. 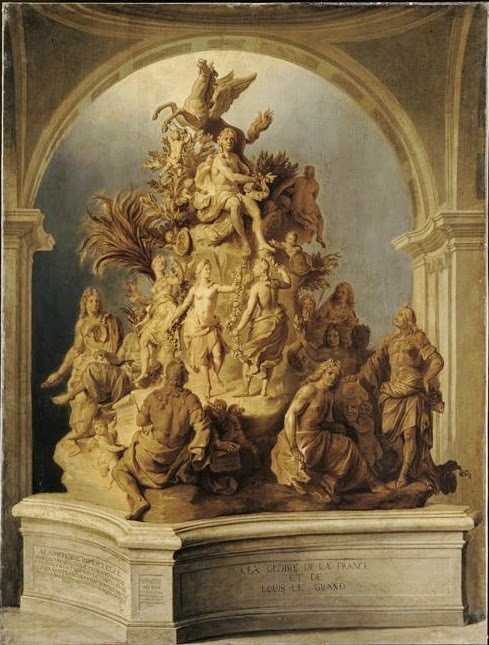 Louis XIV, personified as Apollo, sits at the summit, receiving the homage of Mesdames de la Suze, de Scudéry, and Deshoulières as the Three Muses. Further down are Corneille, Molière, Racine, La Fontaine, Boileau, Chapelle, Segrais, Racan, with Lully, lone representative of the musical arts. Judith Colton has written a book giving details of artistic and iconographic precedents, although it would seem from the reviews that there is no direct evidence for influence by particular pieces. On the whole, Louis Garnier's sculpture is considered a pedestrian piece of late Baroque, not far different in inspiration from the fountains at Versailles. On this scale it is striking; at sixty feet it would be truly monstrous! Titon du Tillet was a man with a mission. Stripped of serious money by the Mississippi Bubble, he was obliged to canvas for backers. 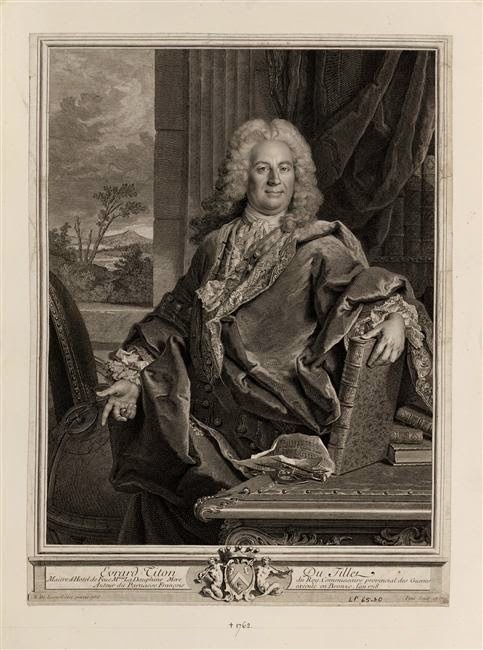 He commissioned medallions, printed prospectuses and exhibited Garnier's maquette in a " Sallon du Parnasse" at Titonville (It was admitted into the Royal Collection only in 1766 some time after his death). A painting was commissioned from Nicolas de Poilly and presented to Louis XV. The project was aired in the pages of the Mercure de France, the Journal des Savants and the Jesuit Journal de Trévoux. By the time of his death Titon was affiliated to twenty eight European academies and fourteen in provincial France. His determination seemed to have been rekindled by the appearance of Voltaire's Siècle de Louis XIV in late 1739; he admired Voltaire but their correspondence reveals that they did not see eye to eye on the merits of the monument, nor on the prospective incumbents, particularly Voltaire's great enemy Jean-Baptiste Rousseau. They were finally reconciled sufficiently for Titon to commission a statuette of Voltaire from Pajou. 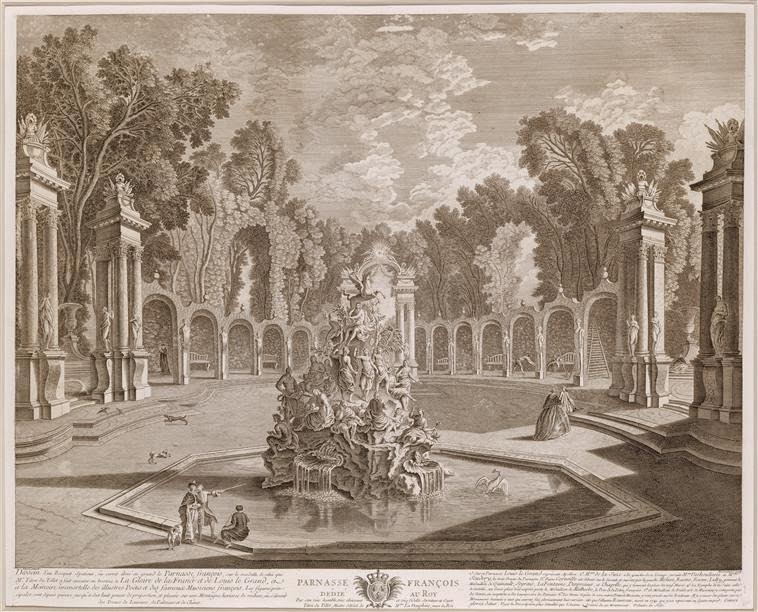 In 1757 Titon commissioned a final engraving by Alexandre Maissonneuve, which shows the projected monument in his imagined setting with a reflective pool and vista of trees. As part of his campaign Titon published a Description du Parnasse français nowadays considered an important source for the biographies of lesser known writers and musicians of the seventeenth century. The first and largest installment appeared in 1732, prefaced with an engraving by Jean Audran after Pouilly's painting; there were further additions in 1743, 1755 and 1760. He also published an "Essay on the Honours and Monuments accorded to Illustrious Savants through the Ages" (1734), a wide-ranging study of historical antecedents, which gives an insight into his mode of thought. In a notable passage Titon imagines a revived Olympic games ("Jeux Lodoïciens") in Paris which, he claims could be held without cost to the state. His vision is closer to the extravagances of Imperial Rome than to the modern Olympiad, with massive amphitheatres in the Faubourgs, naval combats on the Seine and chariot races along the Champs-Élysée. Alas, like his Parnassus, it was not to be!